STOCKTON -- Hard racing was something Eric Holmes and Jim Pettit expected at Stockton 99 Speedway on Saturday night. 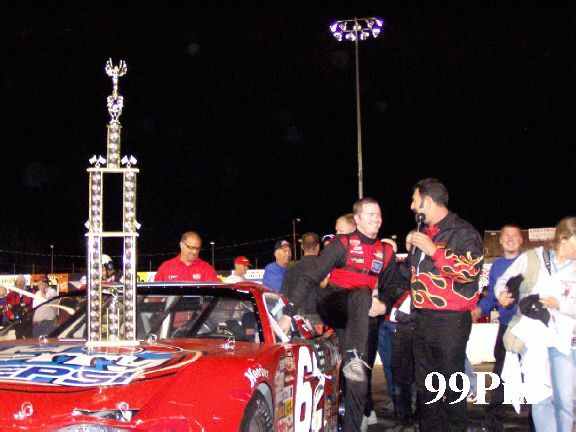 What neither Southwest Series driver anticipated was the other's reaction after the Budweiser 125, which Escalon's, #62, Holmes won for his fifth tour victory. Pettit, #03, finished 15th, and dropped from first in the points standings to second. Holmes and Pettit were locked in a thrilling door-to-door battle from Laps 62 to 88, Holmes on the high line, Pettit inside. The approximately 3,200 fans in the grandstands saw a thrilling show, with no backing down from the pair. Pettit said the banging of the cars led to his back left tire getting cut and leaving him two laps down. He felt Holmes should have given him room, and instead drove into him. "It's more maddening for someone to turn down on you, when you don't expect them to do that to you, when you clearly have the inside line," Pettit said. "We were so much faster. It was a matter of getting by him without crashing." Avoiding an accident was something Pettit couldn't see to do. Where he was better going into the corners, nearly overtaking Holmes a number of times between turns 3 and 4, Holmes pulled away coming out of the corners. When he went to congratulate Pettit for a good, hard race, Holmes said he was surprised the Prunedale resident admonished him for racing dirty. 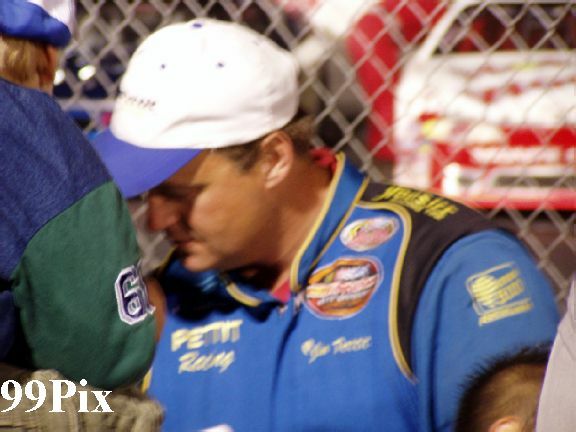 He had praised Pettit for a clean race on Victory Lane, and said he had fun. "It was all just hard racing," Holmes said. "He raced me as hard as you could race somebody. I didn't back out." Eddy McKean, #19, of Jerome, Idaho, had led the first 53 laps before something broke on his car and he slowed on the back straightaway. 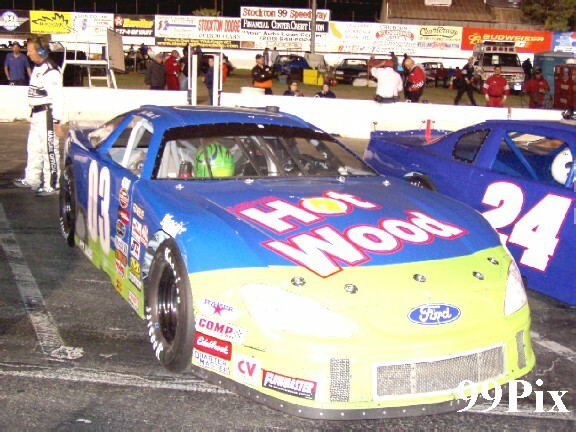 Holmes took the lead with Pettit right behind him on the Lap 62 restart. 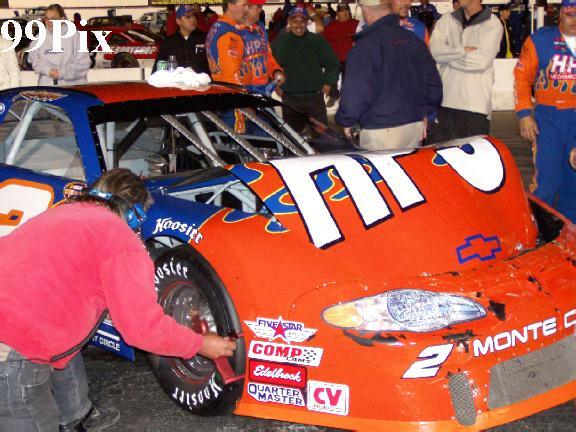 Their riveting chase ended when Poway's Joe Herold experienced car problems that brought out the caution flag in Lap 82. Pettit's tire was cut on the restart on Lap 88. "I don't know what else I had to do to get underneath him," Pettit said. Holmes kept his lead the rest of the way, unchallenged by runner-up #2, Craig Raudman, of Bakersfield, who had claimed his record 28th pole and moved into the points lead. 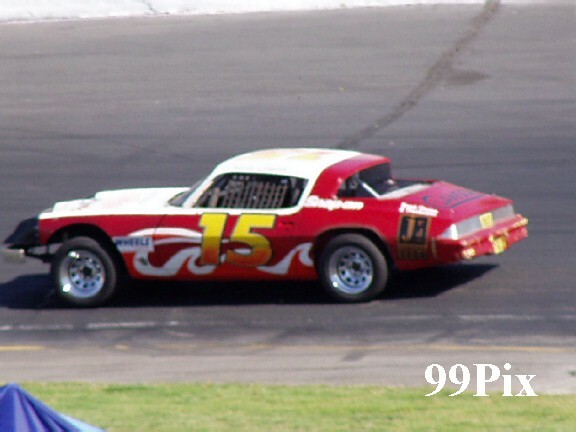 Raudman leads Pettit 811-779 going into the sixth series race at Irwindale Speedway on May 29. Sacramento's Burney Lamar finished third, followed by rookie Rip Michaels of Mission Hills and Agua Dulce's Bob Lyon, who has the most starts in Southwest Series history with 257. Holmes moved up from seventh to fourth in the standings. 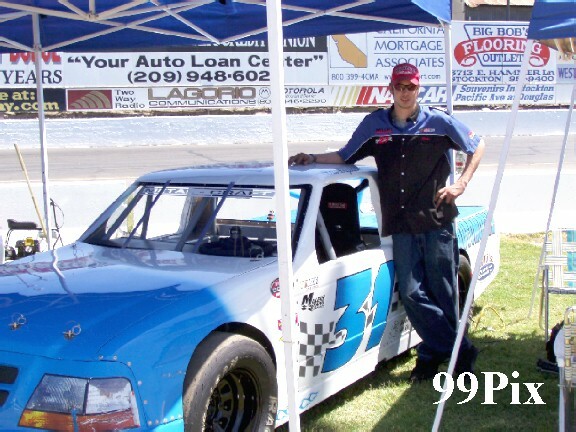 The tour returns to Stockton 99 Speedway on July 31. STOCKTON, CA., MAY 8: Stockton 99 Speedway's merry month of May continued May 8 with a program that included most of the usual suspects - the premier Western Late Model division and the Pure Stock and Pro 4 Truck classes - and the first of two appearances in the 2004 season by the NASCAR Elite Division AutoZone Southwest Series. 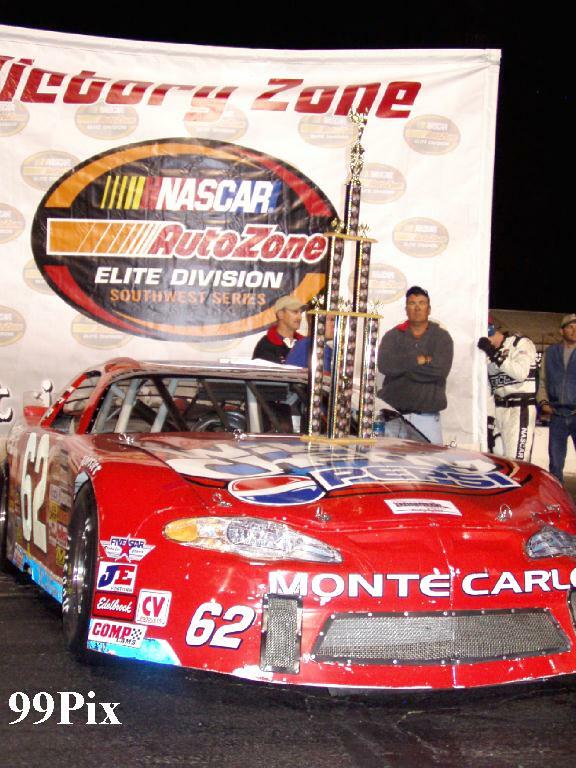 A crowd of more than 3,200 was entertained by a local familiar name winning the Southwest Series Budweiser 125 (Eric Holmes of nearby Escalon), another main-event victory by the increasingly dominating Dave Byrd in Western Late Model, a first-time win in Pure Stock by a townie ("Duct tape" Dave Ball) and a last-to-first victory in Pro 4 Truck (by Chris Drysdale of San Jose). 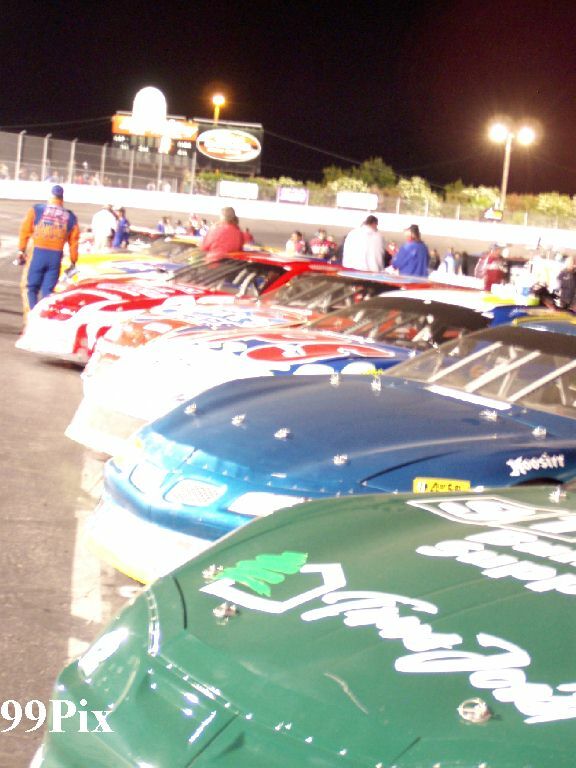 Following a weekend off on May 15 - no need in trying to contend with the NASCAR Nextel Cup race from Richmond, Va., Stockton99 will return to action May 22 with a double-points program involving its house divisions (Western Late Model, Grand American Modified, Pure Stock, Pro 4 Truck and Legends), then follow its left-hand lead with a right hand on May 29, the NASCAR Dodge Country/Havoline/NAPA Auto Parts Grand National Western 150. Also on the card over Memorial Day weekend will be the first leg in the Tri-Holiday Classic series, a 100-lapper for the Western Late Model class, and racing in the Modified division. After what happened May 8, the track needs the rest. 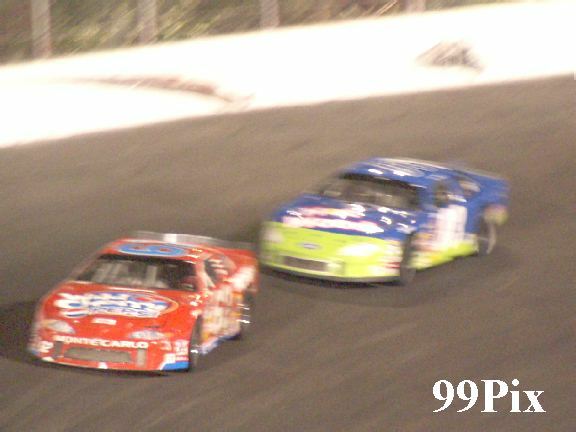 #9, Byrd, the points leader in Western Late Model, shot to the front on Lap 2 of the 30-lap feature and was zipping along several car-lengths in front of Pete Anderson Jr., #5, of Stockton through 16 laps when a yellow flag waved. Byrd won the restart but couldn't put any distance between he and Anderson, who snapped Byrd's three-race win streak the previous Saturday. Byrd also survived in incident that occurred during the green flag to start the race, when he and Guy Guibor, #62, of Manteca came together and spun. Byrd thought the contact might have damaged a tire, but he was wrong. Byrd also maintained his lead after driving into turn three toward #8, Joey Stearns of Stockton, who was a sitting duck after spinning out in turn four on Lap 23, and avoiding him - and Anderson, who entered turn three low. "That was gnarly," Byrd said. "I thought (Stearns) was going to go straight down in front of us. 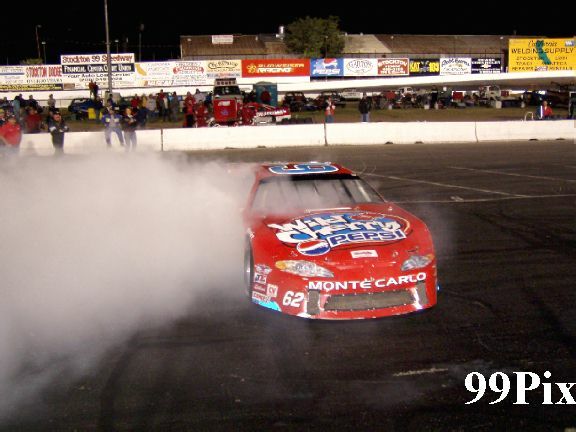 "Stearns held his ground, and Byrd drove to his 42nd career victory at Stockton 99. Anderson was second and Chris Monez, #11, of Turlock third. 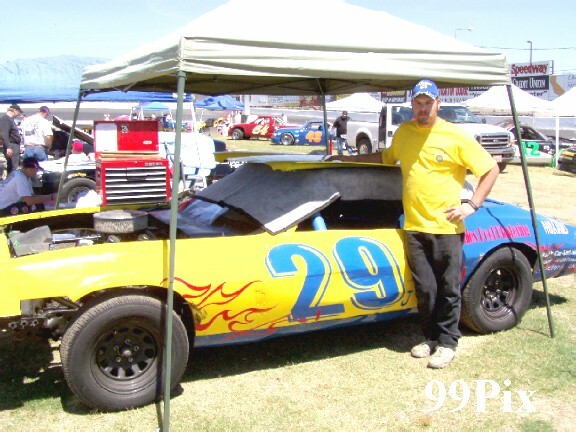 Dave "Duct Tape" Ball's, #29, first victory in the Pure Stock division came under checkered/yellow flags barely halfway through the scheduled 30-lap feature following a big wreck in the backstretch. Two cars started it, then Jacob Cordoza, #32, of Manteca T-boned the ride driven by Tom Bolin, #21, of Valley Springs. Charlie Clawson, #15, of Modesto, the fast qualifier and trophy dash winner, missed his chance at another sweep when he drove into the middle of the mess. Kannai Scantlen, #8, and Richard Harper, #5, were second and third, giving Stockton a 1-2-3 finish. 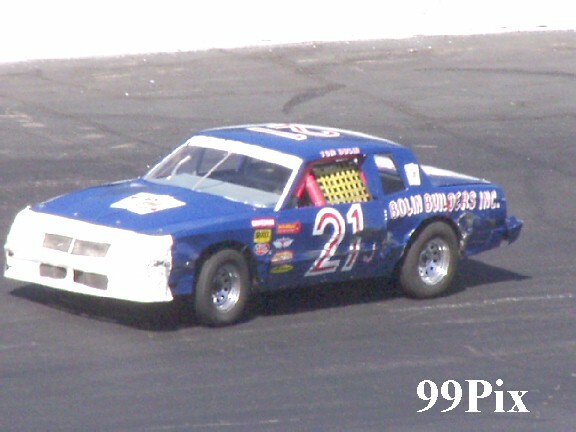 Chris Drysdale, #31, became the first two-time winner in Pro 4 Truck. He started last in the 11-truck field and weaved his way through the crowd before taking the lead on lap 25 of the 30-lap main. Dave Daniel, #76, of Salida was second and Randy Jahoda, #12, of Tracy third. 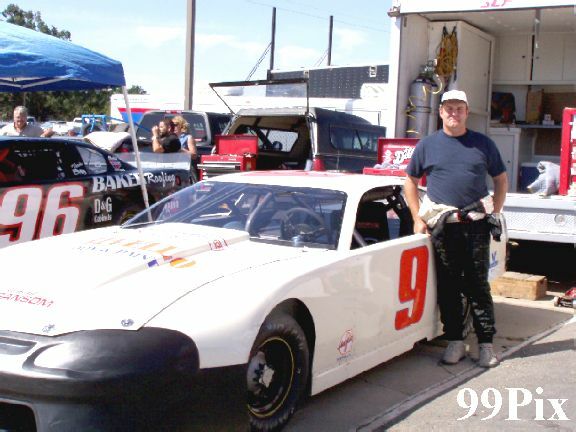 Finally, that left the Budweiser 125, and the 22-car field wowed the crowd, especially Holmes, #62, and Southwest Series points leader #03, Jim Pettit II of Prunedale. Holmes took the lead from Eddy McKean when McKean suffered a mechanical problem. Holmes and Pettit then dueled for 30 laps, including side by side from laps 72-78. Pettit attacked and corners on the inside, and Holmes exploded out of them to maintain a slight edge. They even bumped once, leaving a big doughnut on Pettit's right door. 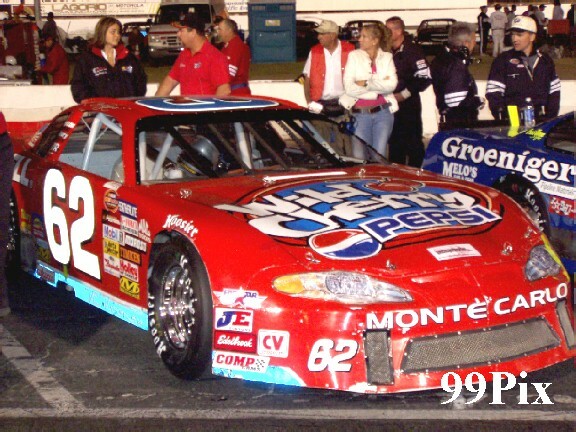 A few laps later, Pettit sat in turn two with a flat right front tire, "compliments of Eric Holmes," he said afterward. To pour salt in his wound, NASCAR officials penalized Pettit one lap for causing a yellow flag." Eric Holmes got dirty with me," Pettit said. Holmes didn't quite see it that way. "It was fun. I trust Pettit," he said. "All you have to do is slip a little bit, and you're done. He was racing me a little harder than I wanted him to." 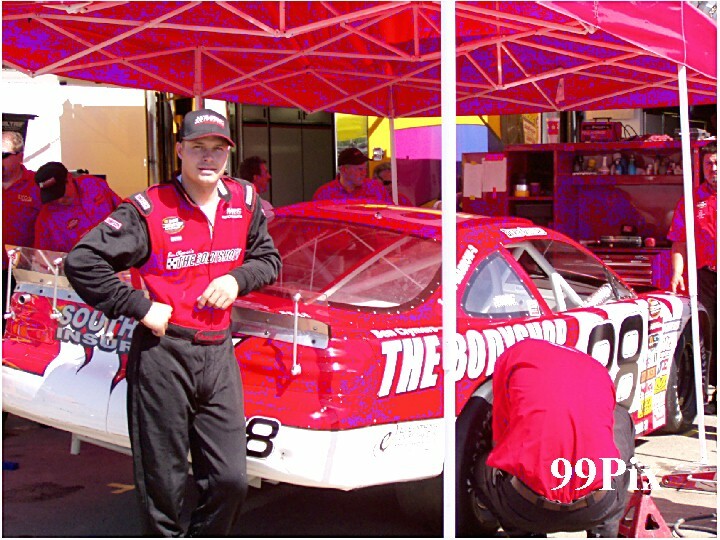 David Gilliland, #88, challenged Holmes next, but he exited the track because of a transmission problem on Lap 111.That left Craig Raudman, who couldn't catch Holmes. The night wasn't a total loss for Raudman, who broke M.K. Kanke's career series record with his 28th Bud pole and took over the points lead. Burney Lamar of West Sacramento finished third and rookie Rip Michels fourth.